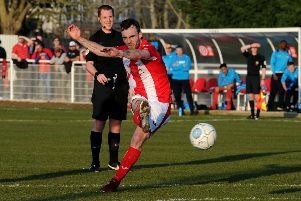 Brackley Town manager Kevin Wilkin will be looking for his side to make it back-to-back wins when they entertain Gloucester City in Saturday’s Vanarama National League North clash. Saints bounced back from the weekend’s FA Trophy exit at the hands of Worcester City to pick up three vital points against Curzon Ashton on Tuesday, their first victory in seven oputings. That lifted Saints four places up the table ahead of another tough test against Gloucester, who sit one place below Wilkin’s side. Goals in each half from top scorer Steve Diggin, his 12th of the campaign, and Pablo Mills plus a penalty save from Sam Hornby proved decisive at St James Park. Wilkin said: “Curzon were a very good side so to get three points was excellent and you can see how those points can take you up the table. The important thing now is for us to pick up another three points against Gloucester. “We had a lot more chances against Stalybridge Celtic but the difference was that we took them against Curzon. Steve Diggin had two chances and scored one, he has a great conversion rate.